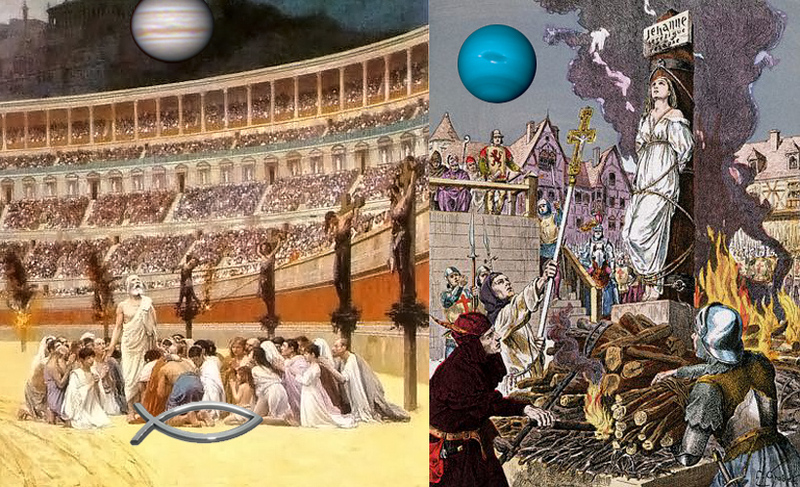 Christianity, martyrdom and the Church highlighted the Age Pisces(0-2000 AD) from its beginnings during the Roman empire to the Crusades and Inquisition periods of Holy Rome and Europe. It was also a time of great art, music, romance, and poetry. The Piscean Age became firmly rooted after the fall of the Roman Empire in 476 AD and the beginning of papal rule in the 500's AD. What followed was a period of general ignorance and superstition which we now term the Middle or Dark Ages -lasting roughly 1000 years. The Rennaisance period beginning in the 1300's, and Colonialism beginning in the 1400's were both attempts to escape the mental and spiritual stranglehold of the Church, and it wasn't untill after the Industrial and American and French revolutions of the 1700's and 1800's that the power of the Church began to wane noticeably. Neptune, true ruler of Pisces and the Piscean Age was dicovered by telescope in 1846. Today's science and technology continue to distance us from the Church and the Piscean Age and into the Aquarian Age.